Demelza Ryan has a problem. She’s producing the Porthhaven Literary and Amateur Dramatic Society production of Classic Literary Vignettes, and after disaster strikes she needs a new Mr Darcy pronto. Enter brooding and aloof horror writer Jack Holliger…. Demelza Ryan stood on the granite rocks overlooking The Minack Theatre – hewn from the cliff-face by Rowena Cade and her gardener Billy Rawlings almost three-quarters of a century ago – and breathed in a fortifying lungful of sea air. Tasting the refreshing tang of salt and inhaling the glorious scent of the flowers that grew wild on the terraces, she let the breath out slowly as the summer dawn hit the for-once deserted stretch of sand below the theatre on Porthcurno Beach. Tonight was going to be absolutely perfect. A culmination of four years spent schmoozing the theatre’s trustees and management committee and four solid months of insanely hard work. 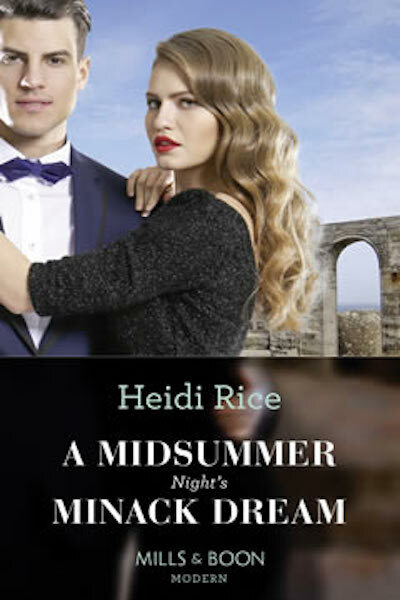 Tonight on midsummer’s eve, as the sun set over the theatre, Demelza was finally going to realise her dream of seeing the Porthhaven Literary and Amateur Dramatic Society – the society she’d created and managed since returning from Bristol University with a degree in Arts Management – take the first of many bows at the place which had saved her life fifteen summers ago. That was the summer she’d arrived on the coach from London, age eight, with her mum, Lizzie, to be dropped off in Cornwall for a long weekend with her Great-Aunt Ada while her mum headed to Glastonbury. She hadn’t seen her mum since. But Aunty Ada, and Demelza’s growing passion for theatre and literature and the arts inspired by The Minack had more than made up for the loss. Lifting her hand to shield her eyes, she squinted into the rising sun. What was Sally Chenoweth – their Ophelia in tonight’s production of Classic Literary Vignettes – doing charging up the steep stone steps as if Pennywise the clown were chasing her? ‘But we’re starting our final rehearsals at noon.’ And Jez and Mel were playing Darcy and Elizabeth. It was the big feel-good finale to the show. And it was Demelza’s favourite vignette – by far – because she’d read Pride and Prejudice approximately a thousand times. ‘They’re too sick. We’ll just have to drop their scene,’ Sally said. ‘What about Jack Holliger?’ The name popped out as the spurt of excitement raced up Demelza’s torso. ‘That writer chap who moved into the cottage behind Minack House?’ Sally stared at Demelza as if she’d lost her marbles. Possibly she had. She’d never managed to get more than a few grudging words out of the guy, despite her best efforts to engage him in conversation because he seemed lonely to her. But desperate measures and all that. ‘Yes, him,’ Demelza said, as the spurt became a definite frission. Dark, brooding, gorgeous and magnetic enough to make her heart jiggle her tonsils whenever he came in to the Post Office where she worked to pick up his mail, Jack Holliger was the perfect Darcy. He wouldn’t even have to act. Demelza looked at the stage, the hexagonal tiles gilded in the sunny glow of morning, and sent up a silent prayer for divine inspiration.